If you have a small space at your disposal and want to keep your home cool during the summer, then you’re probably looking to purchase a low profile air conditioner that is not only reliable, but also helps you manage energy costs. With so many products on the market these days, it can be hard to make a decision without having all the necessary information at hand. From our research, one mistake that most people make is to choose an oversized air conditioner, thinking that it will be more powerful – thus, provide better cooling. In reality, a larger air conditioner will not only consume more energy, but it will also be less effective, as it will not remove all the humidity in the room. 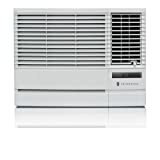 LG is known as a manufacturer of quality appliances and electronics, and this compact air conditioner is no exception. With a powerful rating of 8,000 BTUs, it’s easy for these low profile air conditioners to cool down rooms that are up to 340 square feet. An anti-corrosion coating ensures that this model stands the test of time. This model features an incredibly accurate thermostat, and the air flow can be adjusted in four directions. In addition to electronic controls, this model comes with a remote control to make operation a snap. This is a modern low profile air conditioner, that can be plugged into any standard 115V electrical outlet. It has a 12.1 energy efficiency ratio and is able to dehumidify up to 2.2 pints per hour, which makes it ideal for humid tropical environments if you want to chill a small or medium-sized room. This unit is capable of efficiently cooling a room as large as 250 square feet. With clever streamlining, this unit allows you to enjoy more of your view while also staying comfortable on hot days. This Haier model features four different modes: dehumidify, energy saver, fan and cool. It can be easily mounted in nearly any window without spoiling much of the view. 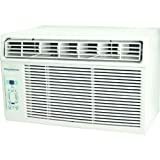 Rated at just over 6,000 BTU, this low profile air conditioner can easily cool rooms of between 150 and 250 square feet. The manufacturer boasts that the noise level from this model as barely louder than a gentle rain. A 24-hour timer with sleep mode gives you total control as does the LED remote control. Note: Interested in more energy-saving ACs? Here’s our rundown of the best energy-efficient air conditioners you could buy in 2019! This 12,000 BTU model is capable of efficiently cooling a room of up to 550 square feet. It comes with all the standard energy saving functions, such as a sleep mode, 24-hour timer, a filter alert and an energy saver mode. Digital controls are easy to read and operate and the remote control works from a maximum of 16 feet away. All in all, this is the absolute best low profile air conditioner you could get in 2019. Interested in more cooling options for your home? Also check out the best wall-mounted air conditioners on the market in 2019 and pick your favorite! This low profile air conditioner has two main features which make it an excellent energy-saving product: it operates the fan only when cooling and it has a 24-hour timer that allows you to program on/off times. Its low noise level makes it suitable not only for single individuals, but also for families with small children, allowing for an accurate room cooling without any additional disturbance. One of the best features of this low profile air conditioner is its “Follow Me” remote control. It works from anywhere within a room that could be as large as 450 square feet. The 10,000 BTUs are more than up to the task while an LED display makes it easy to manage settings. 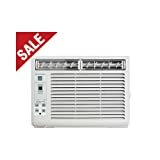 With a mesh filter that’s designed for easy cleaning, a programmable 24-hour timer, and an auto-restart function, this product definitely is the second best low profile air conditioner on the market. As a low profile air conditioner, this Frigidaire model can fit windows that are as small as 23 inches across. Air flow can be adjusted to two different directions, while quiet operation ensures a good night’s sleep. Customers mention its dial controls are very easy to use. 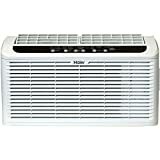 This is one of the most economical low profile air conditioners on the market these days. This compact unit packs a serious cooling punch with its 10,000 BTUs. It works in rooms of up to 450 square feet, so if you have a large space to cool down, this may be an ideal choice. This Koldfront model features three fan speeds and has digital controls for ease of operation. The thermostat is incredibly precise. 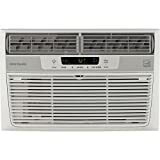 You can use directional louvers to aim the cool air where it needs to go, and the remote control makes this unit very convenient. 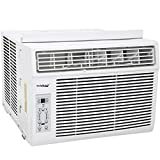 Note: If you’re interested in more air conditioners of similar capacities that you can move around from room to room or from home to home, also check out our list of the best portable air conditioners in 2019! And if you’re in a stump about picking one, here’s our guide to choosing a portable AC for your needs. This product is ideal for people living in a single room or a studio and need a reasonably priced solution to cool their space. With its digital display and electronic controls, it is extremely user-friendly and intuitive even for someone who is unfamiliar with this kind of product. This low profile air conditioner has multiple energy-saving functions (such as auto mode, sleep mode), which are perfect when trying to reduce the electricity bill. 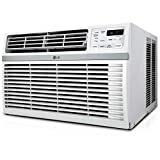 This was our selection of the 10 best low profile air conditioners in 2019 – the absolute best low profile air conditioner is the Koldfront 12,000 BTU Window Air Conditioner, but the Keystone and SPT models are also reliable for larger rooms. 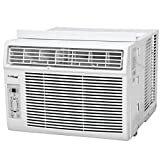 For small rooms, the absolute best low profile air conditioner is the LG model on the fifth spot, but you couldn’t go wrong with picking the Haier Serenity, Frigidaire, or Friederich models. Let us know in the comment section below what your thoughts on these products are or if there’s any particular brand you think should be included in this countdown and why. Agreed! Was thinking the same thing ? Hi, Jennifer! Thank you for your feedback. You are absolutely right. We’ve updated our article if you’d like to give it another read and let us know what you think. We’ve included user ratings, full product dimensions, cooling capacity, as well as other useful specifications. Hi, James! Thank you for your comment. You are absolutely right. We’ve updated our article if you’d like to give it another read and let us know what you think. We’ve included user ratings, full product dimensions, cooling capacity, as well as other useful specifications. Thanks again for your input.